Wow, I have been acclimating to something new...it's called cold weather and rain. Who would have thought in Texas? I almost forgot how to layer my clothes or put any warm outfits together. It didn't take long to get back in the saddle though. I have been having so much fun this week pulling out jackets, scarves, riding boots and sweaters. Finally! Oh, the little things that make me happy, as shallow as that may sound. I picked up this stripe sweater and camel tote during the Forever 21 20% off sale. I almost wish I would have gotten a smaller size in the sweater. So, if you want to grab one for yourself, consider going down a size. I also want to talk about this bag. If you have been reading for a while, you know that I have had some pretty good luck with purchasing items from Forever 21. I understand that some of you would rather spend extra on a few "quality" bags and keep them for years. I am the complete opposite. I only own a few higher end bags, none of which cost more than $200. I would rather have options and buy five items for the price of one. Plus, I am a chameleon when it comes to my personal style and tend to like and want different things each season and year. I have always been super happy with the bags (and most everything else) that I have spent money on at Forever 21. You may beg to differ and think it's all fast fashion, but if you stay consistent about getting on their website you will be surprised at what you can find at great price points. I am by no means saying that the leather is real or the quality compares to higher end bags, but this one that I just grabbed is my new go-to. The proof is in my recent Instagram posts. Plan on seeing plenty more of it. Love the sweater and overall look,this is Fall perfection. You really have a great eye for all things cute at F21. I love this bag and it's amazing looking for being faux fur. I recently got the cutest polka dot top there which I'd been on the hunt for forever. I think I just need time and patience when shopping there. Love this print mixing and that bag is a great find!! This is such a cute sweater! I love it with the gingham underneath! I have just recently started shopping at Forever 21 and I think it's a great place get more 'in-style' pieces. I found it's best to go there when you have something particular you want versus going just to look. I get too overwhelmed! Although their website is a good spot to browse. I am loving the stripes with the plaid. You look so put together, as usual. I always look forward to your posts Shanna. Is this the bag you had with you on Wednesday night? I was eyeing it when you went to the bathroom. It's gorgeous. Love your outfit! You look amazing. I love that sweater! Especially paired with the gingham top :) And that is super cute too! I think this is one of my favorite outfits you've ever had on here. Love it! Happy Friday friend. I'm with you too...I'd rather spend less and buy more. That way I don't feel bad if I only wear it a few times when trends change. I know F21 has great prices, and I have just a couple items from there, but that store still overwhelms me, lol!!! Great bag...LOVE the color! I love the layering here! I have this button up, so now I totally want the sweater too!!!!! I totally agree with you, I'd rather have a few things to chose from than only one, as high end or designer it might be. I also change my mind all the time so there are few items (besides true staples) that I am willing to splurge on and see in my closet for many years. Ugh, I'm the same way. I'm such a moody dresser and my style is constantly changing (except for my love for sneakers) so I'm with you on spending less but getting more bang for your bucks. Also, this sweater is everything especially for the price!!! I do love F21! Such great finds!!! I'm so glad things are looking up and you have such good support. This week hasn't been the best week here either. Feel free to just package up this whole outfit and send it my way! =) I think F21 has really stepped up their game in quality over the last few years. It is SO much better than it used to be. Their Love21 line is my fave...I like the regular sizing over the junior sizing too! You look cute, cute, cute! I love this sweater!! How did I not see this when I was shopping? so cute! I love the bag, the side zipper detailing is super cute! Wouldn't have guessed it's F21. Super cute bag. I have not looked a whole lot at F21 because of the younger (& smaller) demographic, but I should keep an eye out for bags like this. I really like the color and zipper details. Your last post really hit home for me & I was unsure how I could comment. Depression is a frustrating thing that can sneak up on you when you are least expecting it. Thank you for sharing your experiences & shedding light on this issue. I NEVER would have guessed that bag is from Forever 21!! It looks way more high end! I totally agree that you can get great pieces at great prices from Forever 21. My style is so trendy and of the moment, that it usually doesn't make sense to splurge and buy quality pieces. Anyway - I love the pattern mixing here and I'm happy you've been able to break out some fall layers finally! I have some pieces from F21 that I've had for years! I love that store! I need to shop there more because every time I get on their site, I find so many great items and a lot of times they look a lot more expensive than they are. Love your sweater! Also, your hair and makeup looks so so pretty! Love the stripes and gingham! Wow you've gotten yourself too cute F21 stuff - love the oversized sweater on you!!! Your look is so nice, love the shirt! I am the same way, Shanna. I would rather have 5 things instead of 1 because I get very bored, very quickly. Why do we need to defend our love of quick fashion. I have tons from Forever 21 and am damn proud. And that bag looks expensive. 'Nuff said. Love the color combination here! Cute! 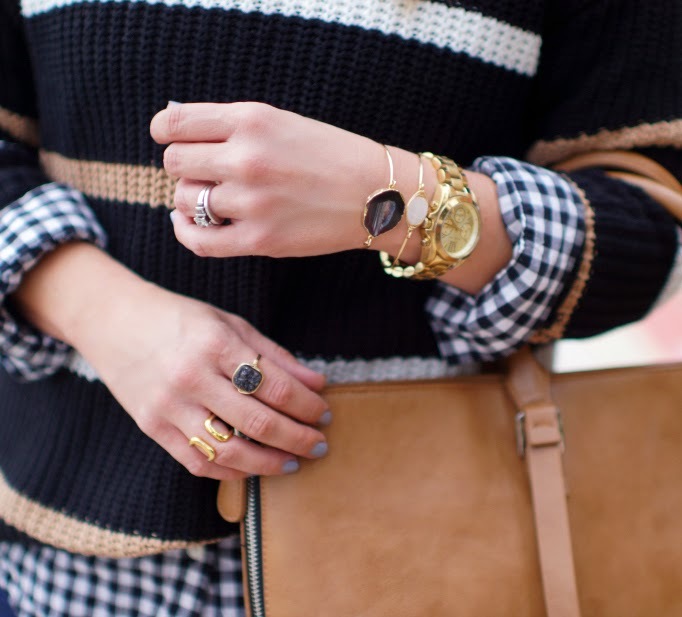 Absolutely love the classic gingham button-up peeking out form the sweater. Great way to mix patterns in a subdued way. I am obsessed with that sweater/shirt combo! And the jewelry! Loveee! can you ship me this entire outfit please?! I am obsessed!